The Office was a beloved series for its nine-year run on NBC, and one of the most popular characters was played by comedienne Jenna Fischer. Fischer is currently a regular on NBC's dramedy You, Me and the Apocalypse, but she'll be returning to the half-hour sitcom circuit with the lead female role opposite Matt LeBlanc on the CBS comedy pilot formerly called I’m Not Your Friend. Jenna Fischer will play a character called Andi, according to THR. Andi is a housewife who decides that she wants to return to her job as a medical lab technician, so her husband Adam takes over parenting duties while she spends her days at work. The pilot will be led by a power couple of comedic performers as Fischer is joined by Matt LeBlanc of Friends fame. Fischer and LeBlanc as Andi and Adam promise that the show has the potential to bring the laughs in a big way. In fact, the writing and producing will have to be pretty abysmal to tank a pilot headlined by this particular duo. Luckily, the pilot is set to be handled by folks who know comedy. The script is being written by Jeff and Jackie Filgo of That ‘70s Show, and James Burrows (who directed the Friends pilot and 1,000 other television episodes) will direct the first installment of the project. Matt LeBlanc will also serve as an executive producer. Both Jenna Fischer and Matt LeBlanc got their big breaks thanks to long-running roles on half-hour NBC sitcoms, so it should be interesting to see them kick off a show on CBS. Only time will tell if the project will be another Office/Friends success story or more of a Joey flop. The potential series was originally called I’m Not Your Friend, but it lost its title sometime between the pilot order and Jenna Fischer being cast. 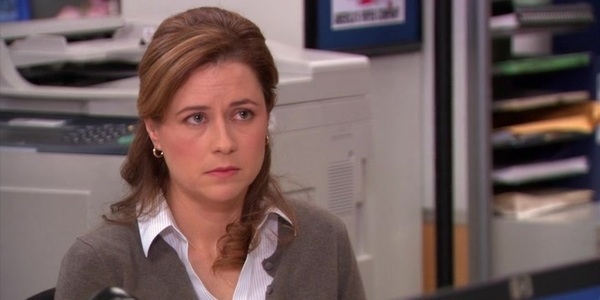 Fischer’s role as female lead may draw former Office fans to the CBS series, but there’s no question that a decent amount of her popularity on The Office was connected to the Jim/Pam romance. We’ll have to wait and see if Jenna Fischer as a settled wife to Matt LeBlanc will be as compelling to Pam fans as Jenna Fischer was as the object of the lovelorn Jim’s desire in early seasons of The Office. Personally, I’m optimistic about the pilot. Fischer really came into her own over the years on The Office, and she can more than pull her weight opposite comedy giants. LeBlanc has proved that he can work wonders in a good cast, so there’s no reason to believe that he and his leading lady won’t be a good fit. We can't say just yet if or when the pilot will hit the airwaves on CBS, but Jenna Fischer being cast as Andi is definitely reason to get excited for CBS' upcoming decision. While we wait, there are plenty of fabulous old Office episodes just waiting to be binge-watched. To catch more of Jenna Fischer in primetime, check out You, Me and the Apocalypse on Thursdays at 8 p.m. ET on NBC.